When four of its hospitals needed to transition from manual to automated temperature monitoring, Allina Health sought a solution that would meet its core requirements: timely alerts to problems and automatic data capture for compliance reporting requirements. Ultimately, it was also looking for an enterprise solution that could form the standard for its entire health system. 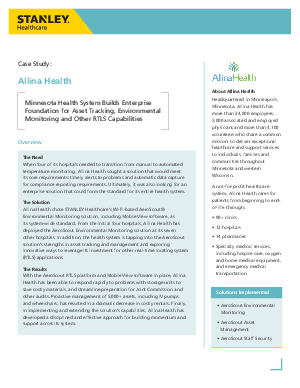 Read this case study to learn why Allina Health chose STANLEY Healthcare’s Wi-Fi-based AeroScout® Environmental Monitoring solution, including MobileView software, as its system-wide standard to build an enterprise foundation for asset tracking, environmental monitoring, and other RTLS capabilities.